BOULDER, Colo. – JILA physicists have demonstrated a novel laser design based on synchronized emissions of light from the same type of atoms used in advanced atomic clocks. 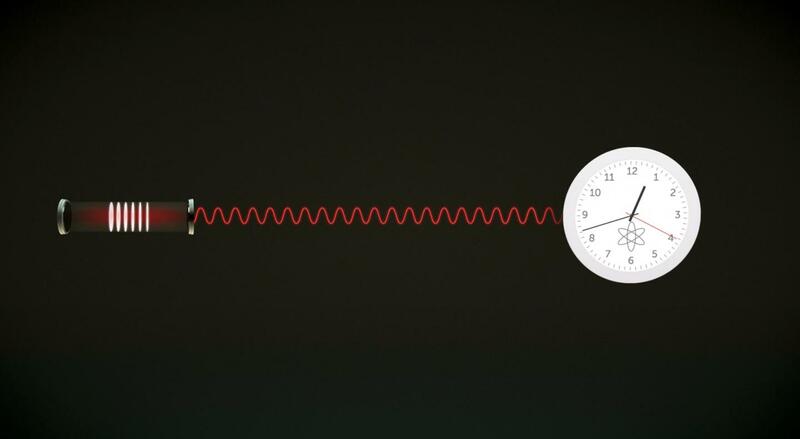 The laser could be stable enough to improve atomic clock performance a hundredfold and even serve as a clock itself, while also advancing other scientific quests such as making accurate "rulers" for measuring astronomical distances. Described in the October 14 issue of Science Advances, the "superradiant" laser's output of red light is expected to be about 10,000 times less sensitive than conventional lasers to pervasive mechanical vibrations, or noise. As a result, the new laser can lock onto an exact frequency, or color, more tightly, making it 100 times sharper as a precision tool. The work was done at JILA, a partnership of the National Institute of Standards and Technology (NIST) and the University of Colorado Boulder. NIST has long been a world leader in developing ultra-stable lasers, and the new work provides a qualitatively new approach for advancing the field further. The same JILA group demonstrated the basic principle for a superradiant laser in 2012. Now the scientists have built the laser using the same type of atoms used in JILA's world-leading strontium lattice clock. In fact, the new laser might be used as an atomic clock all by itself. Strontium atoms were chosen because they have an excellent "memory" of their exact color or frequency. They can potentially store this information for 2.5 minutes, compared to the mere 100 billionths of a second of typical atoms. This allows the superradiant laser to store and protect most of the laser's color information inside the atoms. In contrast, ordinary lasers store this information in light bouncing between two mirrors, and any mirror vibrations scramble it. The ability to maintain a precise frequency is crucial for applications like atomic clocks, which rely on lasers to make atoms "tick" from one energy state to another. "But here is the rub: The very long memory of the atoms is awesome, but it also makes it extremely difficult to get the atoms to emit any light, which provides the information for us to use," said JILA/NIST scientist James Thompson. "But in this superradiant laser, for the first time, we have coaxed these atoms to emit their light 10,000 times faster than they would normally like to emit it." JILA's superradiant laser uses 200,000 strontium atoms stacked in layers of 5,000 and trapped in a hollow enclosure–a cavity–between two mirrors (these mirrors do vibrate, but the frequency information is stored in the atoms). The atoms are chilled to temperatures near absolute zero and levitated in a vacuum by an optical lattice, a "crystal of light" created by intersecting external laser beams. The experiment begins by briefly shining light on the atoms to prepare them in their long-lived excited, or high-energy, state. An environmental signal–quantum noise of empty space–prompts the strontium atoms to spontaneously start ticking as their outer electrons begin to bounce back and forth from one side of the atom to the other. The oscillation is like a miniature antenna that radiates a very small amount of light into the cavity. This very weak light, consisting of only a few light particles, or photons, bouncing back and forth inside the cavity, allows the atoms to communicate and synchronize with each other. This synchronization phenomenon is also evident in pendulum clocks placed near each other, and even in the flashing of fireflies. As the synchronization spreads and strengthens, more and more light is emitted, until eventually all theatoms have moved from an excited (high-energy) to a calm (low-energy) state. Light bounces back and forth between the mirrors nearly 30,000 times before leaking out through the mirrors. All of the energy initially stored inside of the atoms has been converted into a pulse of laser light lasting 50 hundredths of a second. When synchronized, the collection of small antennas act like a single "super antenna" that broadcasts power into the cavity at a much higher than normal rate–a process called superradiance because the collective emission is 1,000 times more intense than independently radiating atoms. The emission rate increases proportionally to the number of atoms squared, making the laser much brighter than is possible without synchronization. Future studies will investigate use of the pulsed superradiant laser light as an absolute frequency reference for such applications as atomic clocks. In addition, researchers hope to create a continuous superradiant laser beam by constantly returning atoms to the excited state. "The superradiant laser light is still billions of times weaker than typical lasers, but the key point is that the color or frequency of the light should be very stable," Thompson said. Such a laser might be just as stable as the atoms used in the most advanced clocks. Today's best atomic clocks are limited in part by laser noise. Because a superradiant laser essentially uses an atomic clock as its energy source, the laser light both reads out the ticking of the atoms and is immune to cavity mirror vibrations. Better lasers may also have applications in space science, perhaps as rulers of light that could reach across distances as vast as from the Earth to the Sun, potentially enabling the detection of gravity waves in space, for example. The research was funded by the Defense Advanced Research Projects Agency, Army Research Office, National Science Foundation and NIST. Paper: M.A. Norcia, M.N. Winchester, J.R.K. Cline and J.K. Thompson. Superradiance on the milliHertz linewidth strontium clock transition. Science Advances. October 14, 2016.